Significantly better performance characteristics of the batteries can be achieved if they are charged to produce an asymmetric volume. Diagram of the charging device, which implements this principle is shown in the figure. During the positive half-cycle of the input AC voltage current flows through the elements VD1, R1 and stabilized diode VD2. 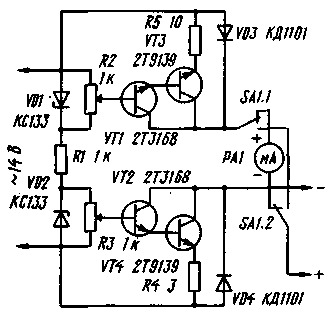 Part of the stabilized voltage through a variable resistor R3 is supplied to the base of transistor VT2. Transistors VT2 and VT4 low-side devices operate as a current generator, the value of which depends on the resistance of the resistor R4 and the voltage on the base of VT2. The charging current in the battery circuit flows through the elements of VD3, SA1.1, RA1, SA1.2, the battery, the collector of the differential transistor VT4, R4. When the negative half cycle of the alternating voltage on the diode VD1 the operation of the device is similar, but works the upper shoulder - VD1 stabilizes the negative voltage that regulates flowing through the battery current in the reverse voltage (discharge current). Shown in the diagram milliammeter RA1 is used during initial setup, it can be disabled by moving the switch to another position. This charger has the following advantages: 1. Charge and discharge currents can be controlled independently from each other. Therefore, in this device it is possible to use batteries with different energy value. 2. When any outage of the AC voltage each of his shoulders and rose through the battery current does not leak, that protects the battery from accidental discharge. In this device from domestic items can be used as VD1 and VD2 - KC133A, VT1 and VT2 - KT315B or KT503B. The remaining elements are chosen depending on the charging current. If it does not exceed 100 mA, the transistors VT3 and VT4 should apply KG815 or KT807 with any alphabetic indices (to be placed on a heat sink with the heat dissipating area of the surface 5...15 sq cm), and the diodes VD3 and VD4 - D226, CD also with any alphabetic indices.